Norway is a beautiful country with mountains, valleys, and fjords, and Nettbuss will take you comfortably through it all. The advantage of Nettbuss is that the bus routes cover large parts of southern, western and inland Norway. All buses are equipped with comfortable seats, air-conditioning, and Wi-Fi for you to enjoy. Sit back and relax as you watch the scenery pass by and know that this is the best and most efficient way to travel to your destination. The night buses on the longer routes make your journey extra comfortable and relaxing. Some lines have double-deckers (Nettbuss express plus), which give you even more space and comfort. Nettbuss express offers an efficient, comfortable, and not least affordable way to travel through Norway. Covering large parts of Southern Norway, most of the Nettbuss express routes start or end in Oslo, and most of them also stop by the city’s main airport. 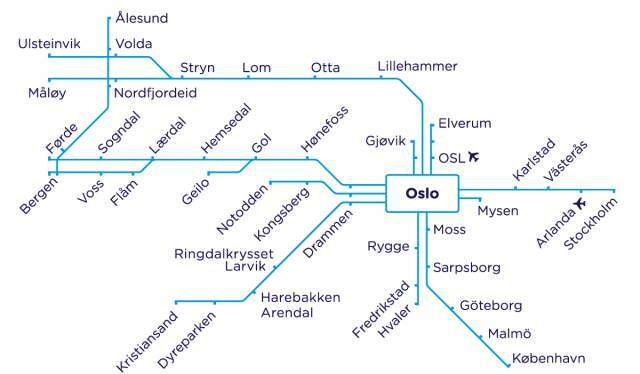 Nettbuss express’ extensive network connects Fjord Norway and the rural parts of the country to cities like Oslo, Bergen, Ålesund, Lillehammer, and Kristiansand, in addition to Stockholm, Gothenburg, and Copenhagen. Through the panoramic windows of the bus, you get the best view of some of the most scenic places in Norway, regardless of the season. In summer, for instance, you can take corresponding buses to and from popular Geiranger in Fjord Norway. Nettbuss also runs a summer bus service between Oslo and the Swedish border town of Strømstad. During the ski season, you can catch a bus to some of the most popular winter sports destinations in Norway, and you can get a package deal that includes a bus ticket and a lift pass at a reasonable price. or in the Nettbuss mobile app. By pre-buying your tickets online, you can both save money and are guaranteed a seat in the bus. , or in the Nettbuss mobile app. Nettbuss has a wide range of coaches, buses, and mini-buses for hire with a driver. And if you are going on a trip with colleagues or friends, they will find a bus that suits your needs. With branches across most of the country, Nettbuss is ready to drive you safely to all destinations in Norway and abroad. To request tour suggestions or a non-binding offer, please contact travel@nettbuss.no.